I love quilts. Old and new, bed size and baby size. I especially love hand quilted quilts. With each carefully taken stitch, one by one, the thread binds together layers of softness to form a unique, heirloom-quality quilt meant to provide warmth and comfort over and over again. As a maker, I find the creative process of selecting fabric and playing with design exhilarating and the repetitive nature of sewing and hand quilting therapeutic. Every home needs a quilt (or many). Whether it's to add a brightness of color or a layer of texture or just a means to keep warm in a favorite spot, quilts are meant to be a treasured part of one's home. They make beautiful gifts for loved ones, especially when carefully and thoughtfully custom designed. The best quilts are the ones that have beautiful memories woven into them! Handmade quilts are a labor of love. 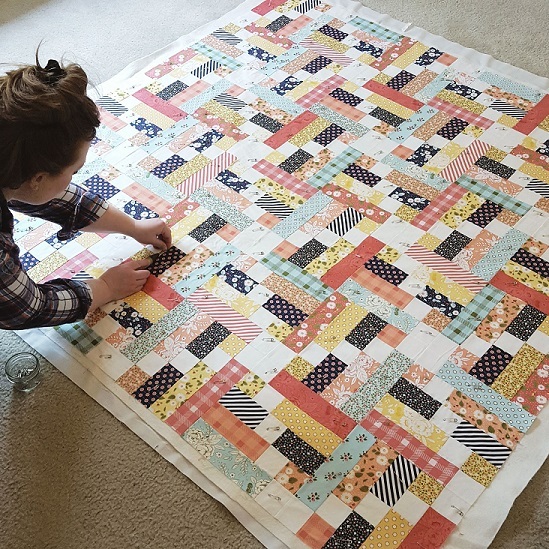 Hand quilting, in particular, is a slow and deliberate process. Every stitch is carefully made, with design and quality in mind. The end result is a truly unique piece as no two quilts will ever be the exact same. I love creating quilts with beautiful high-quality fabrics, old and new quilt patterns, and simple hand stitches that combine a fresh, modern take on an art that is so rich in history.